This extended three bedroom property situated on a corner plot benefits from outstanding schools and excellent road links on it's doorstep. 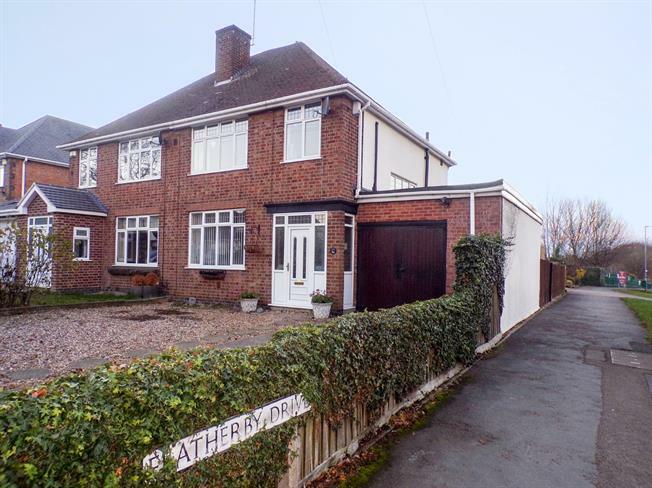 Accomodation comprises of porch entrance and hallway leading to a sizeable and modern breakfast/kitchen area, a through lounge diner leading to a conservatory with french doors leading to a delightfully landscaped patio and garden. From the Kitchen there is an integral door to the garage with double doors leading to the driveway. Upstairs there are 3 bedrooms off landing and a main family bathroom. The property is gas centrally heated and double glazed throughout. Double Glazed Upvc door leads to porch. Parquet Flooring with stairs leading to the first floor, doors leading to the living area and kitchen. Radiator and ceiling lights. Carpeted Flooring with french doors leading to conservatory, radiator heated. Fitted wall and base units, Integrated electric oven and hob. Space for fridge freezer, washing machine and tumble drier. Double glazed Upvc door to the rear garden and integral door to the garage. Upvc Double glazed window surrounds, Polycarbonate roof and French Doors leading to the garden. Leading to bedrooms and bathroom. Low level WC, single enclosure shower, wall-mounted sink, extractor fan.